Staff from the Illinois State Archaeological Survey (ISAS) are looking to new technology to tie Cahokia’s grid to real-world coordinates. This will be the first time researchers and other state agencies will be able to integrate LiDAR with excavation data at Cahokia. The Cahokia Mounds State Historic Site has been acknowledged as an international cultural treasure through its recognition by UNESCO as a World Heritage Site. 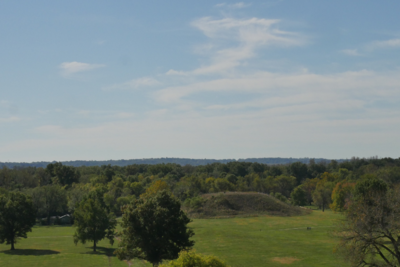 Cahokia is one of only a few dozen sites in the United States with this designation. In spite of this importance, a comprehensive modern map has yet to be made of the entire site. The first and most widely used map was completed in 1966 by Melvin Fowler of the University of Wisconsin-Milwaukee. Using air imagery, Fowler used photogrammetry to create a topographic map of the entire site that he verified with traditional ground surveying. The “Cahokia grid,” as it is referred to, has been used by researchers for over 50 years. A limitation of this grid is its zero-datum point is not tied to a real-world location–instead it is spatially free-floating. In conjunction with the Illinois Historic Division of the Illinois Department of Natural Resources, ISAS is working to tie the Cahokia grid to real-world coordinates. During the early 1970s, permanent grid markers were embedded across the site. Now, through the use of modern high-accuracy GPS survey equipment, ISAS scientists are obtaining real-world coordinates at these grid markers with an accuracy of several millimeters. This information is being made available to researchers and other state agencies. For the first time, archaeologists at the site will have the ability to integrate real-world data such as LiDAR or air imagery with their excavation data. The positions of features of the site such as mounds or borrow pits can be refined. The integration of real-world coordinates, coupled with modern mapping methodologies such as aerial LiDAR and drone-based imagery, allows archaeologists to build from the work of Fowler and reveal previously unidentified features of the site.